The Samuel family appears here on the Man family web site as a result of the marriage between Marian Samuel and Jonas Reis. Their great granddaughter, Sheila Allwynne Cran Reis, married Frank Man in October 1947. Marian Samuel was the daughter of Moses Samuel of whom more below. The Samuel family arrived in England from Posen on the continent in the late eighteenth century and settled in London. The family at the time consisted of Menachem Samuel, his wife Hannah Israel and son Nathan Meyer Samuel. Two more sons were born in London, Louis in 1794 and Moses in 1795. Young Louis took off for Liverpool at an early age to continue the family business of watch making and selling jewelry. After the death of Menachem, Hannah followed her son Louis to Liverpool bringing Moses with her. For a genealogical print out of the Samuel and other families and which does not include (as far as possible) living descendants click HERE. The two brothers, Louis and Moses, married two sisters, Hannah and Harriet Israel, who were also their maternal cousins. Thus making the descendants of Louis and Moses much more closely related than would otherwise be the case. For the purposes of this web site the genealogical connection to the Samuel family is as follows: Moses Samuel was the father of Marian Samuel who married Jonas Reis whose youngest son Alphonse Louis Reis married Marian Dugan whose son Gordon Stanley Reis was the father of Allwynne Reis who married Frank Man. Moses Samuel was also the father of Hannah Samuel and a page devoted to Hannah’s descendants including the Sandheim and Bamberger families can be found following this link. The two Samuel bothers would have been surprised at what their descendants achieved with the businesses which they started. In the case of Louis whose son Montagu changed his name to Samuel Montagu, founded the bank that would bear his name. He also became the second Jew in Britain to be raised to the peerage, to become Baron Swaythling. 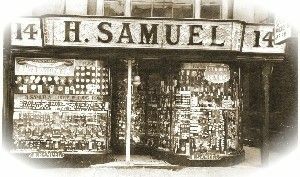 Moses’ business flourished after his death to become H. Samuel, the largest jewelry chain store in the United Kingdom. Other branches of the family also changed their names so Edgar Samuel became Samuel Edgar, Lawrence Samuel became Lawrence Lawrence, and one group of Samuels became Hill. Some of the Israel family became Ellis and Helbert. John Helbert, who was Hannah and Harriet’s second cousin, married Adeline Cohen daughter of Levi Barent Cohen. Adeline’s sisters had also married well: Judith Cohen married Sir Moses Montefiore and Hannah married Nathan Mayer Rothschild. 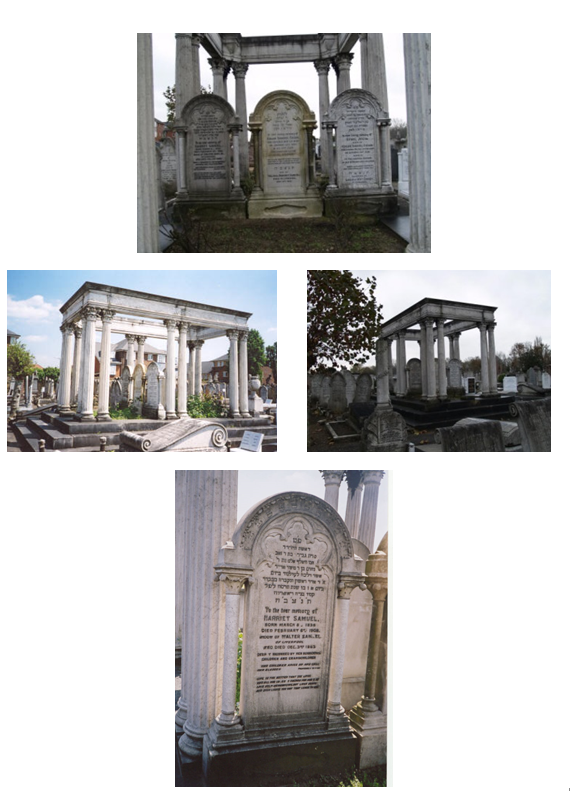 The main source of genealogical information for the Samuel, Reis, and other families comes from the book ‘The Samuel Family of Liverpool and London…’. To view a signed title page of this book click HERE (<— PDF). Another useful source is ‘The Cousinhood’ by Chaim Bermant. Collateral families of Samuel and Reis include: de Pass, Emanuel, Goldsmid, Mocatta, Montefiore, Sebag-Montefiore, Rothschild, de Lyons, Helbert, Israel, Solomon, Salamans, Franklin, Davis, Cohen, Aaron, Jacobs, Lazarus, Waley, Lousada, etc. A summary of Moses Samuel’s life by Professor Bernard Wasserstein appeared in the Transactions of the Jewish Historical Society and can be accessed HERE (< — PDF). His will can be read here. Moses Samuel’s somewhat bizarre letter to Lord Brougham can be read here (<— in PDF). Moses Samuel’s letter to the newspapers on the conduct of a barrister: ‘The Jew and the Barrister‘. The letter was reprinted in various newspapers and some of these reprints are repeated here. James Schmidt of Boston University’s introduction to Samuel’s translation of ‘Jerusalem’ is available at the Thoemmes Press web site here. 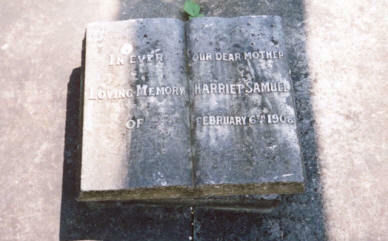 Below some Samuel family graves at the Willesden Cemetery, London. These are the descendants of Moses Samuel. Gilbert Harold Edgar was the grandson of Walter and Harriet Samuel. 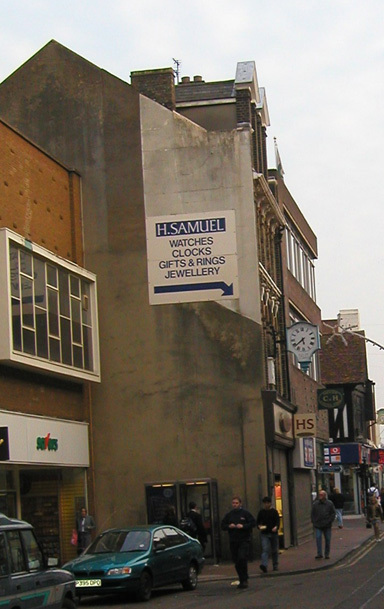 Below H. Samuel in Maidstone, Kent. (Section F, Row E, Number 12). WHO DIED DEC 3RD 1863. AND EVER LIGHTS THE WAY THAT LEADS TO GOD. (Section M, Row L, Number 32). 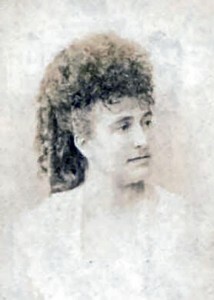 The above Harriet Samuel (nee Schreiner-Wolfe) married Walter, Moses Samuel’s son. 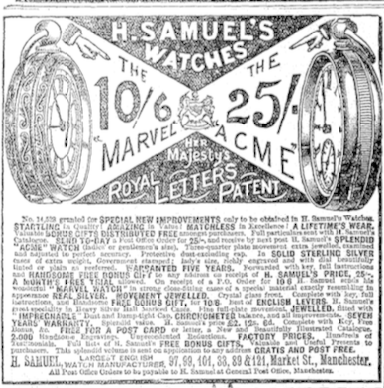 It was she who put the ‘H’ in H. Samuel the jewelers.